It’s jellyfish season. More jellyfish stings happen in August than any other month. This is because jellyfish mate in the warm months, which just so happen to coincide with vacation season, so the chances for swimmers to come across a jellyfish during these months is high. Right now, it’s the Sea Nettle that swimmers encounter while taking a dip. 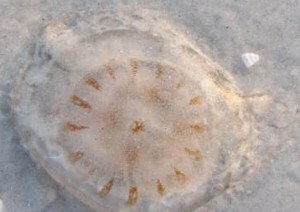 According to the South Carolina Department of Natural Resources, this jellyfish is saucer-shaped and has brown or red pigments. The tentacles that hang from the body of this jellyfish are what swimmers want to avoid. Granted, avoiding a jellyfish in the water is nearly impossible. They are very hard to see and often times once they’re spotted it’s too late. But don’t let the threat of a jellyfish sting keep you out of the water. It’s true that a sting can be painful, but there are ways to quickly ease the pain of a jellyfish sting. Anyone stung by a jellyfish should remove the tentacles that stick to the skin as soon as possible. This generally means a jellyfish victim will run out of the water wide-eyed and then start rubbing sand on his or her arm or leg (or wherever the sting occurred). Most time the tentacles do not remain on the skin, but if they do, use sand, a beach towel, clothing, or anything else to get the tentacles off of the skin. The tentacles discharge the venom (which causes the stinging sensation) as long as they are on the skin. Items that help reduce the stinging include vinegar, sodium bicarbonate, sugar, meat tenderizer and coconut oil. Keep in mind that while a jellyfish sting is uncomfortable, in most cases it results in nothing more than a little area of irritation that goes away rather quickly. The stinging sensation goes away quickly and generally the only reminder of the sting is a raised area of bright red flesh. Some people unfamiliar with jellyfish may panic and think that a call to 9-1-1 or a trip to the emergency room is in order, but, unless the person stung is experiencing shortness of breath, vomiting or another symptom of a severe reaction, the best thing to do is to relax and treat the sting with the homemade remedies. If reading all this makes you a little hesitant to get back in the water, realize that every day hundreds of people swim in the ocean and do not get stung. Plus, even if you do get stung, it will make for an interesting story to tell once you go back home.